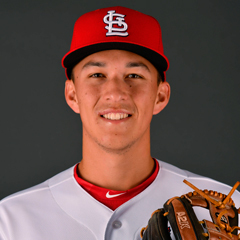 St. Louis Cardinals Lane Thomas and Tommy Edman drew four walks between them and scored once in Surprise’s Friday loss. Connor Jones started and threw two scoreless innings and Will Latcham added a clean inning in relief. Results for the game played on Friday, November 2. 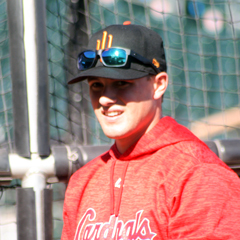 Two Cardinals position players and two pitchers saw action in Friday’s game against Salt River. Lane Thomas played center field and hit sixth in Surprise’s lineup. In his first at bat in the second inning Thomas drew a walk but was left stranded. In the fourth, the outfielder struck out looking. Thomas led off the seventh with his second walk, and later scored on a single by Nick Heath. Tommy Edman played second base and hit ninth. Edman led off the third with a walk but did not score. The second baseman walked again in the fifth but was doubled off on a line drive double play. In the seventh, Edman popped out to the Salt River second baseman. In what appeared to be a bullpen game, Connor Jones started for Surprise and pitched two scoreless innings, allowing one hit, fanning three and walking two. Will Latcham pitched the fourth inning out of the bullpen, allowing one hit and one walk, but neither scored. Saturday’s game: No regular AFL game is scheduled. The Annual Fall Stars game will take place at Surprise, with first pitch at 7:08 CT. Pitcher Evan Kruczynski is the sole Cardinal on the West roster. The game will be televised on MLB Network and online.